So you're driving your bike and then the battery dies. You try charging it up but discover it's at the end of its life. What do you do? You obviously need to buy a new battery. However, should you necessarily buy the same brand of battery you got from before? Or should you "upgrade" your big hog altogether and get an even better battery to work it out? Even though the motorcycle's heart and soul is the engine, it can't work without the battery. The battery is the spark that jumpstarts the engine in bikes as well as other vehicles like cars and trucks. A motorcycle battery that's worth its salt should match the amperage requirements of the motorcycle while at the same time having a favorable warranty. 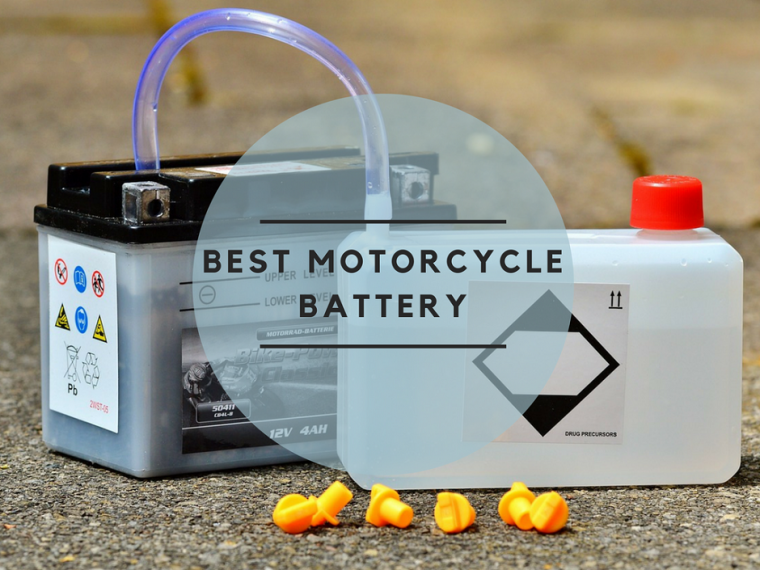 This motorcycle battery review article aims to assist any difficulties you may have in shopping for the best motorcycle battery by turning you into an informed consumer who knows what you want. For instance, a good motorcycle battery should be simple to service if it's not sealed and can last a long time in any climate, resisting cold starts and whatnot the best that it could. It's not difficult to find the right battery once you know where to look. You can go to a motorcycle spare parts shop and a repair shop for OEM or refurbished batteries, or a scrap yard for parts salvaging. Batteries are available in shapes and sizes as well as amperage ratings. You can pick between rechargeable, sealed, and unsealed batteries as well. Whether it's for your motorcycle or for your car, a battery comes in several different types with their own respective pros and cons. These are the different things you can expect from every type of motorcycle battery. Rechargeable Batteries: They don't need immediate replacement. You can recharge them at will and you can reuse them for a long, long time. It can be recharged many times, discharged into a load, and charged whenever you want. Sealed Batteries: They don't require maintenance. They can work for quite some time without you having to clean them out and whatnot. Also known as the VRLA battery or maintenance-free battery, it's a battery with lead-acid cell electrodes suspended in diluted sulfuric acid electrolyte. Unsealed Batteries: An unsealed or wet battery requires more maintenance, like caps for topping up water and can only be mounted upright. When left standing, it has a fast discharge rate. They're the most maintenance-heavy battery around, leading to many preferring the former two types. Here are the top brands to check out when it comes to motorcycle batteries. 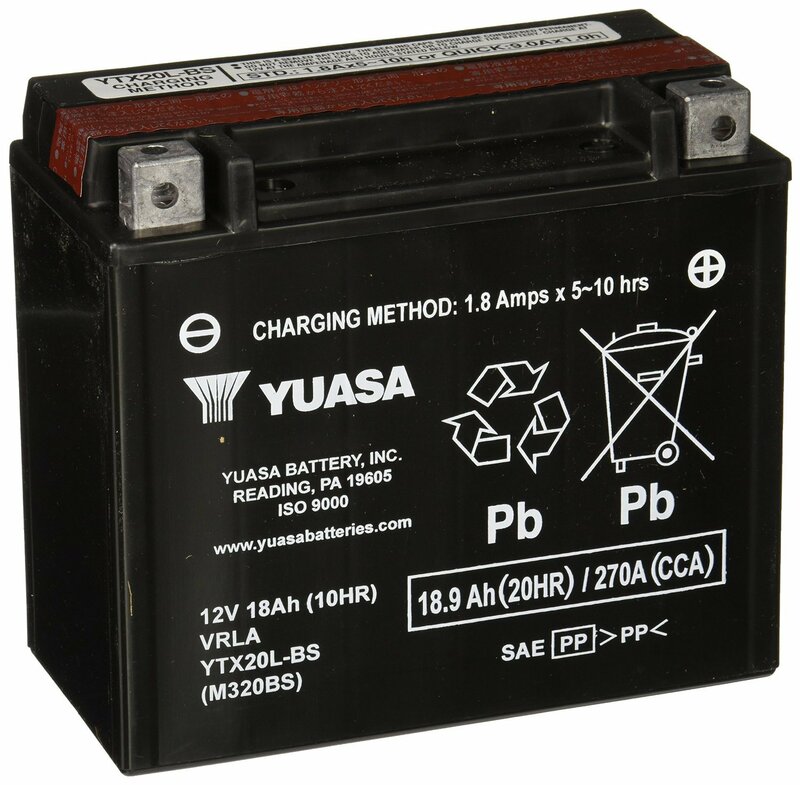 Yuasa: The main claim to fame of Yuasa is that they make motorcycle batteries that are made in America, which coincides with the uncompromising American standards of excellence and effectiveness since 1979. The Powersports batteries of Yuasa are specifically manufactured in their state-of-the-art Laureldale, PA plant. You can also order their batteries online for added convenience. 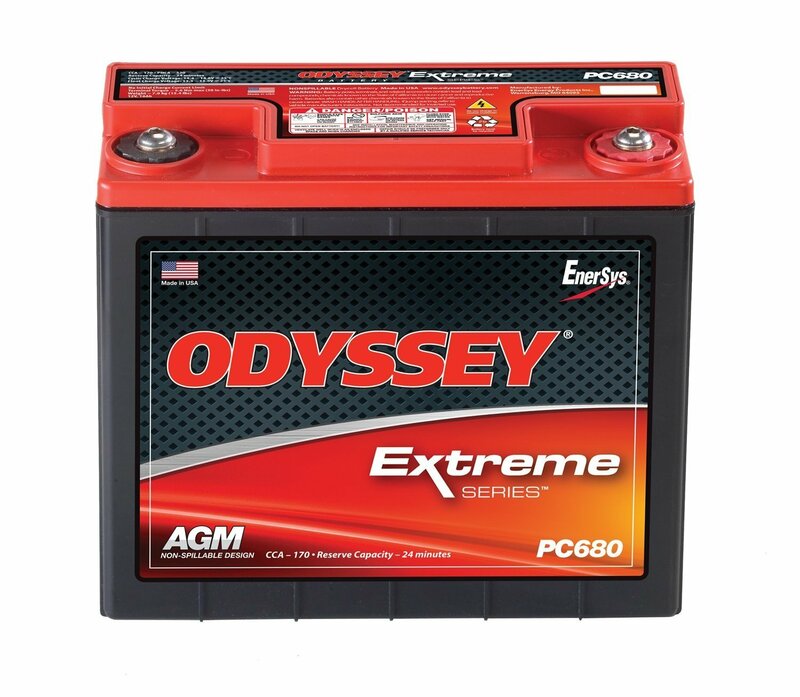 Odyssey: Odyssey or ODYSSEY also has a line of batteries for Powersport that cover motorcycles as well as snowmobiles and ATVs. ODYSSEY Powersport batteries cover punishing treatment and grueling usage whether it's on the land, sea, or snow. It's rugged in its construction, featuring a tightly packed AGM design with pure lead plates that protect against vibration or shock that quickly destroys other batteries. ACDelco: ACDelco is a supplier of quality GM OEM replacement parts and battery replacement provider with over 90,000 auto parts produced over 37 product lines that are distributed all over the globe. In regards to their batteries, they also have ones for motorcycles in particular along with automotive, marine, or recreational vehicles. Their batteries are backed with impressive warranty coverage, laboratory-tested quality, and field-proven performance. Off-Brand Aftermarket Battery Replacement: The beauty of getting an off-brand battery replacement is that there a lot of times when you can get OEM-quality replacements for a fraction of the price even without the brand name to back it up. When purchasing aftermarket batteries, make sure to check the battery expiration date and search for one that's no older than six months in order to ensure a fresh product every time. Here are some recommended and highly rated motorcycle batteries you should check out. This is a fresh type of motorcycle battery that's compatible with a whole host of motorcycles from the Yamaha YZF R1 to the Honda CBR600RR as long as battery fitment is established by max crank amperage, physical battery dimensions, type of battery to be replaced, and so forth. The Yuasa website itself establishes the full list of compatible model years and specific make and model of motorcycles that the Yuasa YTZ10S covers. The Yuasa YTZ10S is particularly lauded by customers for its CCA or cold crank amperes. It lasts a long time and has CCA available to turn on or start your motorcycle motor over a given period of time. This is also the go-to battery to purchase online for a battery of its size (a 2.2 pound battery with the dimensions of 6.2 x 4 x 3.8 inches) because it's apparently quite annoying or even outright difficult to get replacement bike batteries with this specific size. As soon as compatibility is established, you're practically assured of a good aftermarket battery by my estimations. What few complaints that people might have for this brand of battery mostly relates to defective batteries slipping through the cracks of Yuasa's quality control. Aside from that, for the most part, this small-sized battery for economy-class motorbikes is a sound investment as long as you can establish proper compatibility with your bike (or other off-road and all-terrain vehicles) and this battery. 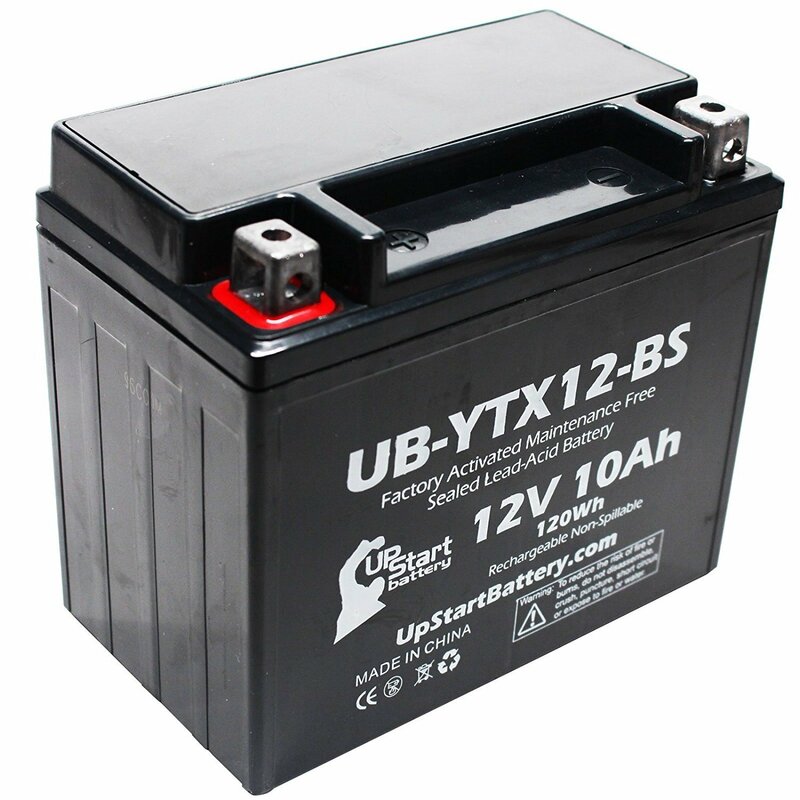 The YTX12-BS Battery is the sealed type of battery discussed above that, compared to an unsealed or wet battery, has fewer issues when it comes to its upkeep (although it's not fully maintenance-free, you still need to guard against possible discharges). Like many other generic replacement batteries, customers approve of it for its relative low price and long lifespan. The YTX12-BS Battery is an UpStart Battery Brand that doesn't only cost a fraction of a typical motorcycle battery. It's also always on sale for a limited time, which should save you even more money when push comes to shove. It has a capacity of 10Ah and a voltage of 12 volts. 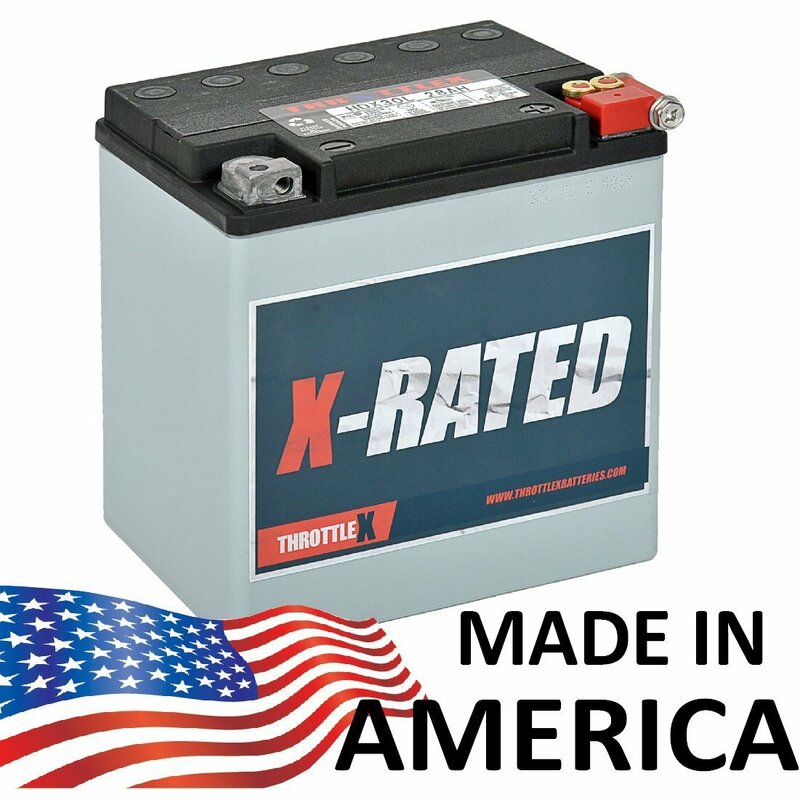 This sealed battery is also a lead acid battery that's factory activated and low maintenance. The battery is also made in China, so as a result the instruction booklet's Pidgin English might be a bit much to translate. When you open it, it should test about 13.07 volts when it's opened. It should also activate or fire your motorcycle up immediately for about half the price of your typical Yuasa battery (it's $35-$40 versus $25-$30). This replacement battery is compatible with motorcycles like the 2004 Triumph Speed, 2002 Suzuki GSF1200S Bandit, 2001 Suzuki TL1000S, 2001 Suzuki GSF1200S Bandit, 2012 Kawasaki ER6n, 2007 Aprilia Tuono, 2008 Triumph Speed Triple, 2010 Triumph Speed Triple, 2001 Triumph Bonneville, 2001 Triumph TT600, 2008 Kawasaki Ninja 650R, 2001 Suzuki GSX-R1000, 2003 Suzuki GSX-R1000, 2003 Yamaha YZF600R, 2004 Suzuki GSX-R1000, 2009 Kawasaki ER6n, 2011 Kawasaki Ninja 650R, 2009 Kawasaki Ninja 650R, 2007 Kawasaki Ninja 650R, and 2006 Kawasaki Ninja 650R. The appeal of the Yuasa YUAM620BH YTX20HL-BS Battery mostly roots from the fact that you can choose between two versions of the same battery—the sealed battery that's worth about $85-$90 or the battery with charger that's instead worth $120-$125. You can get a complete battery package of a rechargeable battery complete with charger or a decent sealed battery that's compatible to most bikes out there. The sealed motorcycle battery is a relatively high-performance battery that offers 18 amps per hour, 12 volts, and 310 CCA. It's spill-proof and completely sealed so that all the acid is absorbed through absorbed glass mat separators and special plates. You don't need to add water to it and it has advanced lead-calcium technology that allows it to hold its gravity 3 times longer than standard batteries. The motorcycle battery plus charger version of Yuasa YTX20HL-BS is also a high-performance battery that's low maintenance and offers 310 CCA, 18 amps per hour, and 12 volts. Aside from sharing its specs with its non-rechargeable counterpart, it also has a charger that maintains the battery with a 3-Stage Charge Cycle reaching a peak of 14.4 volts before going into maintenance mode. Aside from that, the Yuasa YUAM620BH battery charger has desulfating features that allows it to bring long dead batteries to life. The charger has an input of 120VAC at 50/60 Hertz and an output of 12VCD at 1 amp. The package even comes supplied with acid bottles to boot. The Odyssey PC680 Battery mainly promises from 3 to 10 years of service life depending on how much you use your motorcycle and how regularly the battery gets revived by the alternator. It has an impressive 170 CCA and up to 400 cycles at 80% depth of discharge. It can even hold high stable voltages for longer periods of time compared to its competitors. The PC680 also has a high recharge efficiency, with it capable of getting 100% recharge in just 4-6 hours. It's also a sealed battery with a no-spill design to ensure mounting flexibility and less danger on your part when getting it mounted. It's even designed to be vibration resistant, which is something you won't see in other batteries. Aside from having an impact-and-shock-resistant body that can mitigate mechanical vibration, the Odyssey PC680 Battery is also extremely tolerant of high temperatures. The bottom line here is that customers who've availed of PC680 praise it for how long-lasting the battery is on their battery. They can use it for years on end and it should last 12 times longer than standard wet batteries. As long as you properly maintain the battery (even maintenance-free batteries are in fact low-maintenance items that still require a modicum of maintenance to work) to avoid discharging it, you can get a maximum of a decade of service from it according to its most ardent of fans and users who've seen it last that long firsthand. The aftermarket replacement battery of the "X-Rated" (it identifies itself as much on its packaging and the battery body itself) HDX30L is ostensibly a Harley Davidson grade of replacement battery. It specifically fits Harley Davidsons made from 1997-2016. It can serve as a replacement battery for models like the Harley Davidson Ultra Classic, Street Glide, Road King, Road Glide, and Electra Glide. The main appeal of this generic battery aside from its low, low price of $115-$120 (relative to the expensiveness of OEM Harley Davidson batteries) is its ready to install setup that's low maintenance and fully charged from the get go. The manufacturers claim their item to be an OEM-grade battery and judging by its online ratings and reviews on its performance on forums and ecommerce sites, this checks out. In terms of specs, the battery offers 26Ah and 400 CCA. It has the dimensions of 6.6 inches by 5.2 inches by 6.9 inches and a weight of 23 pounds. It even includes stainless steel bolts, patented solid lead female threaded terminates, heat sealed cover, and AGM (absorbed glass mat) no-spill sealed technology. It's a high-grade kind of large battery reserved for use on the really big hogs and bikes around. It can even serve as a perfect fit for motorcycles like the 1999 FLHRCI as long as the specs check out. Like the Yuasa YUAM620BH YTX20HL-BS Battery, the Yuasa YUAM320BS YTX20L-BS Battery also comes in two versions—one with a charger included and one without. The package with the low-maintenance sealed battery only costs $85-$90. It's a 12-volt battery that offers 270 CCA and 18 amps per hour. It's also a sealed battery with its own spill-proof and totally sealed technology like the X-Rated HDX30L Battery for Harley Davidson motorcycle use. To be more specific, it has absorbed glass mat separators and special plates that absorb all the acid, leading to efficient battery installation. It even has lead-calcium tech that holds the specific gravity to 3 times longer than ordinary batteries. It also comes with its own acid bottle. In other words, it has many of the same specs as the Yuasa YUAM620BH YTX20HL-BS. 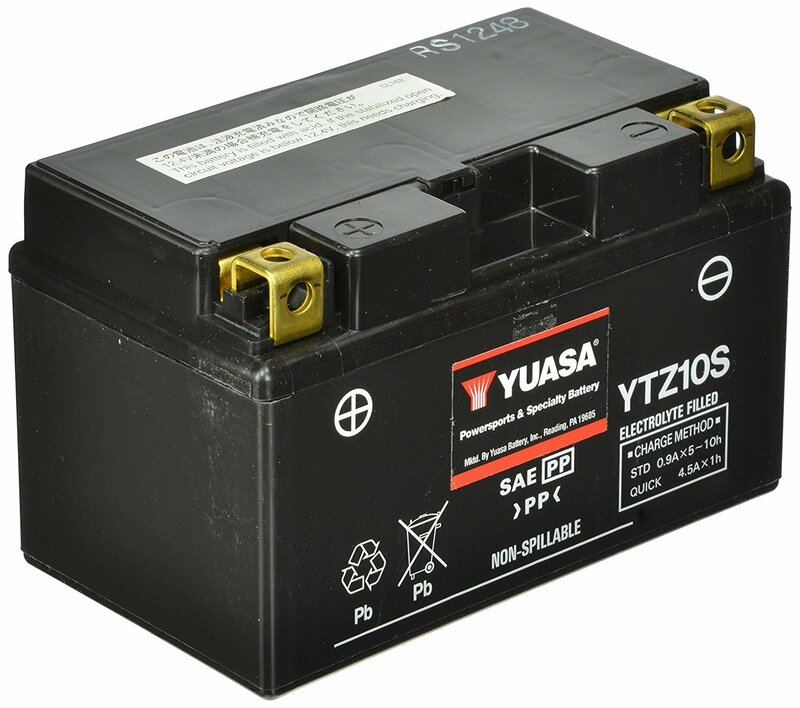 Speaking of which, the Yuasa YUAM320BS YTX20L-BS Battery is also a 12-volt battery that offers 270 CCA and 18 amps per hour. The major difference between this and the battery-only package is its charger. It also only costs $115-$120. 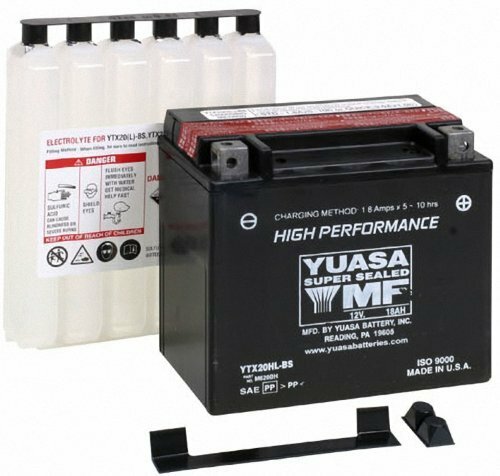 Like the Yuasa YUAM620BH YTX20HL-BS, the spill-proof and totally sealed Yuasa YUAM320BS YTX20L-BS also has a charger that maintains the battery charge care off a 3-Stage Charge Cycle that reaches a 14.4-volt peak. It has an identical input of 120VAC at 50/60 Hertz and an output of 12VCD at 1 amp. 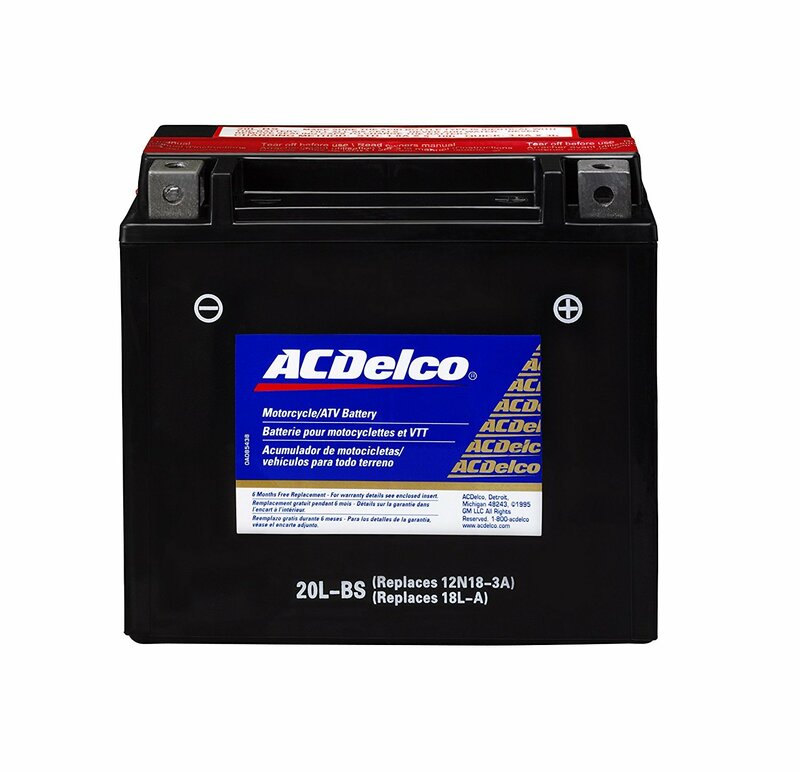 Last but not least is the ACDelco ATX20LBS Specialty AGM Powersports JIS 20L-BS Battery. Powersports batteries are usually reserved for motorcycles as well as ATVs and snowmobiles. The ACDelco ATX20LBS is a quality item that's shipped dry with separate acid pack and costs $75-$80. It needs an initial charge before installation in order to lengthen the shelf life of the product to its maximum length. While some customers might not like having the battery acid outside the battery, finding it a bother to have to fill the battery themselves, this is actually the safer way to do things that ultimately protects the battery. The bottle ensures that the correct amount is placed. No left over acid will have to be disposed. What's more, you won't have to worry about the battery spilling out of the battery itself during shipping and handling, leading to further needless damage and acid loss. The ACDelco ATX20LBS has your requisite specs of the absorbed glass mat design that assures no spills from the sealed battery. It's called a maintenance-free (it's more accurate to call it low-maintenance) battery because it has lower requirements of upkeep. It doesn't need liquid after the battery is sealed. Just install the vent caps and you now have a maintenance-free (or low-maintenance) sealed battery that you only have to safeguard against discharges. Here are the things to keep in mind when shopping for a battery for your motorcycle. A battery for motorcycles that are only used for occasional joy rides is different from the needs of a motorcycle ridden extensively every day. How often you use your battery is an extra consideration on top of specific batteries for the type of motorcycle you drive (i.e., a cruiser motorcycle battery). Contrary to popular belief, infrequently ridden motorcycles that only deal with short trips require more powerful, longer-lasting batteries versus motorcycles that are ridden daily for commutes and deliveries. The reason for this is because seldom-used motorcycles have batteries that are only occasionally reenergized by your alternator. It's subjective as far as the aftermarket world is concerned. When buying an aftermarket battery, it ultimately depends on what price the seller is going to set (such that even identical or same brand batteries might differ from merchant to merchant or shop to shop). However, as a rule of thumb, it's always cheaper than OEM. You have different ways to deal with this situation. You can research the retail costs of specific bike batteries to make sure the prices being offered to you by merchants is close to or lower than the suggested retail price. You can also buy online, since buying online is assured affordable due to the lower overhead needed by online sellers to maintain their business. Full-sized motorcycles typically require bike batteries that put out 12 volts. If you have a smaller bike, you'll probably only need six-volt batteries instead. However, batteries also differ in terms of amp ratings. Keep that in mind because motorcycles also differ in terms of amperage requirements. Meanwhile, a Gold Wing type of big touring motorcycle will need much more power in order to run all of its electronics along with starting your engine. In contrast, a 125-cc dirt bike is much more sparse in specs and features, thus it can run on a smaller battery. Read up on which batteries are compatible with your hog through your owner's manual or through Internet research. As far as lead-acid batteries are concerned (which is used by almost every motorcycle) is that they lose power all by themselves if not used often (not unlike a diesel engine of a truck or van). There's a daily range of 0.5% to 1% of drainage of the battery's power. Infrequent riders also use a trickle charger in order to avoid an unexpected dead battery. This gadget will keep your battery from discharging. However, you should also avoid overcharging your standard battery because it's as damaging as letting your battery die it. You should balance things out and make sure the battery is charged just right if you're a rider who seldom rides your bike. Depending on the climate and the size of the motorcycle that will be ridden, the number of cranking amps or cold-cranking amps delivered by your battery is incredibly important. The cranking amp rating of the battery relates to the amount of amps delivered at 32°F for 30 seconds while keeping 1.2 volts per cell. Look at your owner's manual to look up the required ratings for cranking amps as well. Even at the temperature of 0°F the cold-cranking amp rating should be the same. This consideration should assist you when it comes to cold starts and keeping your battery running even during cold weather or infrequent usage. So what is best battery for your motorcycle? Compatibility is important, especially when you're buying an aftermarket battery replacement. Your budget can also help dictate which battery options are available to you. Keep in mind that sealed batteries require less maintenance, unsealed batteries require heavy upkeep, and rechargeable batteries are expensive. As a rule of thumb, if you use your battery daily you're fine with a standard rechargeable battery and if you use your battery infrequently you should get a trickle charger and a longer-lasting battery to avoid discharges since your battery is only sometimes revitalized by your alternator. How big should your battery be? You should always go with a motorcycle battery that perfectly fits into its compartment or bracket exactly. If not, it could get dislodged due to its smallness or cause you discomfort because of all its rattling. This is also why people prefer buying batteries that are the aftermarket version of the original battery. Meanwhile, a battery that's too large is also problematic in the sense that it might get stuck, it's hard to remove and replace, and it won't have enough space for the vent hose if it's the unsealed type of battery. Not to mention the fact that it might have the wrong voltage or amperage altogether. Do I have to charge a new motorcycle battery? The motorcycle battery (even the gel battery type) are 80% dry charged. You battery can only ever be 80% efficient if you don't give it a top up charge for 3-4 hours. If you have bigger new batteries for big touring motorcycles, it's recommended that you charge them overnight prior to using them. Not bothering with the top up charge won't only leave you with a reduced battery capacity. This also shortens the overall battery lifespan and ultimately wastes your money (because you never got to use the battery in full capacity before it's permanently discharged). Don't put your battery straight on the bike for charging because it will only cause your battery to be 80% efficient instead of 100% efficient. What's more, doing so can come with the risk of damaging your new battery. Avoid unnecessary destruction of your battery investment that shortens its lifespan by charging the battery with the recommended motorcycle battery charger. New batteries should only be charged this way and you should make sure the charger is for motorcycles only (no general automotive chargers allowed). Buy the battery that makes the best fit or most sense for your motorcycle. When shopping for the best motorcycle battery, make sure to balance out its performance and compatibility with its price and your budget so that you can maximize your investment. You have the choice between an upgrade or buying a clone of the battery you've lost. What's more, prior to purchasing a replacement, check the standard-issue battery of your motorcycle. Keep in mind that rechargeable batteries are more expensive than standard batteries, so look at your owner's manual to check if your vehicle is compatible with the battery you're buying before spending money on it. Don't replace a sealed battery with an unsealed one because that can incur damages.